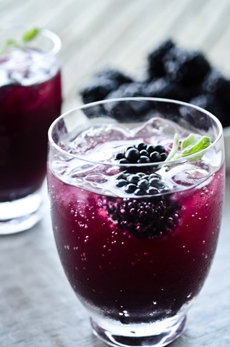  Blackberry cooler (photo courtesy FreidaFroo.Wordpress.com). 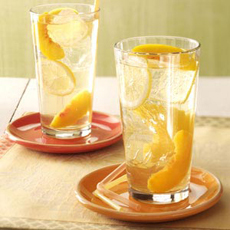 A peach wine cooler (here’s the recipe from TasteOfHome.com). 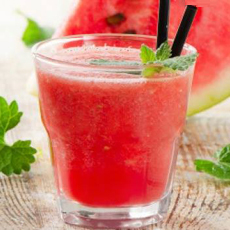 Watermelon cooler with green tea and white wine (photo courtesy Serendipitea.com). Commercial wine coolers: the lowest common denominator (photo courtesy Majestic Brands). Short for wine cooler, a cooler is a tall drink typically made with wine, fruit juice and soda water (you can use any glasses you have). It’s a less complex relative of sangria. Don’t like wine? Try the latest cooler incarnation, the beer cooler. Modern coolers are refreshing summer drinks that trace their ancestry to hot-weather countries in ancient times. Wine-based drinks have long existed in the Mediterranean, the birthplace of wine. The earliest archaeological evidence of wine production found to date has been in Georgia (c. 6000 B.C.E. ), Iran (c. 5000 B.C.E. ), Greece (c. 4500 B.C.E. ), and Armenia (c. 4100 B.C.E.). The wine could be drunk straight or mixed with honey, spices or other ingredients, especially by the kitchen staff of rich households and at public drinking houses for the hoi polloi. It was a less sophisticated product than today’s wine, with no sophisticated fermentation or aging techniques. Thousands of years before stoppered glass bottles were invented, wine was stored in clay jars. 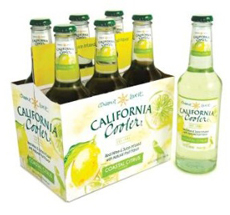 Flash forward to the present: Wine coolers have been sold commercially since the early 1980s [Source]. Bartles & Jaymes, a brand of E & J Gallo Winery. The latter makes flavors dozens of flavors, including Strawberry Daiquiri, Fuzzy Navel, Margarita and Piña Colada. However delicious these may sound, they were formerly made with wine that Wikipedia calls “the cheapest available grade,” since most of the wine flavor in obscured by the sugar and the fruit juice. According to Lucas J. Meeker of Meeker Vineyard in Sonoma County, domestic wine coolers were largely made from a base of apple wine. Blend your own recipe to find create your signature wine cooler. To develop your recipe, use a shot glass to combine 1/3 each of wine, juice and sparkling water. Fruit juice: cherry, cranberry, grapefruit, pineapple, etc. 1. PURÉE the watermelon and run it through a fine mesh sieve (yield about 1.5 cups juice). 2. WARM a teapot with a little hot water, discard, place the tea leaves in the pot, allowing heat of the pot to release the bouquet of the tea leaves. 3. HEAT water to below boiling (approximately 180°F). Steep 1 teaspoon (2.5 g/8 oz. cup) up to 3 minutes & refresh cup as desired. Vary the time according to taste with this caveat: steeping tea leaves beyond 3 minutes does not give you more flavor, only bitterness. *Try Albariño, Chardonnay, Chenin Blanc, Gewurztraminer, Gruner Veltliner, Muscat, Pinot Gris/PinotGrigio or Sauvignon Blanc.